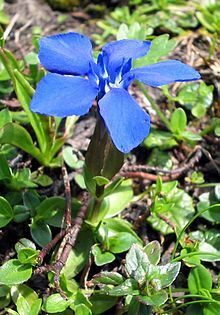 Gentianaceae are a family of flowering plants of 87 genera and over 1500 species. Distribution is cosmopolitan. The family consists of trees, shrubs and herbs showing a wide range of colours and floral patterns. Economically, some species are cultivated ornamental plants and many species yield bitter principles used medicinally and in flavorings. Many of this group are mycoheterotrophs: their roots need fungi to break down organic material for them to absorb. This page was last changed on 22 February 2019, at 12:36.